Comodo Firewall Pro will secure your system against internal attacks such as Trojan viruses, malicious software, and external attacks by hackers. With a user-friendly single click interface you can allow or block access to the Internet offering complete immunity to attacks and total protection of your personal information. Real time traffic monitoring enables you to react instantly to threats and identify bandwidth bottlenecks. Silent Security Technology means no needless alerts with out-of-the-box protection against hackers, Trojans and other unknown threats. The new versions have addressed almost all issues reflected in reviews on BetaNews. It is OK for 32 bit......BUT Comodo has nothing but bugs and slowness in 64 bit!! I will never use it for 64 bit again!!!!! Just uninstalled outpost free which scores just below this on matousec. Oupost was using 40% cpu ++ on torrents and for some reason it was blocking IE if I disabled dns service. This does have ad options (toolbar, homepage crap) but they are options. I installed in basic fw mode with nothing else. Removed all the trusted vendors (couldn't remove the 2 comodo entries!) and set explorer.exe (which I don't run cause I use sharpe shell) to no dns access. So far no nags at all and cpu is nil with torrents. See how it fares. Online armor pay version is still at the top of the chart. Adobe also tries to install crap. should we blacklist them too ?. Comparing a tested trusted fw to an adware site like softpedia is a joke. I have rated this -5 before as the gui was a nightmare. time will tell. 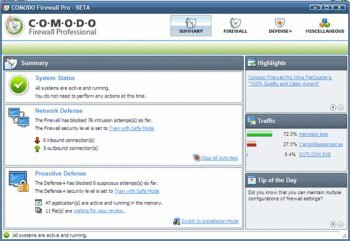 Comodo is alright but I didn't realize how much of a strangle hold it actually put on my bandwith until I removed it in favor of a router. Its really a shame that Comodo has become, now its a bloatware with adware instalation, some software portal like Softpedia delete Comodo from his list because Comodo refuse to throw away his adware instalation, really really shame. A solid firewall if you are looking for something kinda basic. However, the consistent popups are annoying and often times for safe programs. If you don't mind the constant popups for permission, it's solid. It can also be a little heavy on the RAM, but with most computers having at least 512 MB of RAM at the very least(for older computers) it is not so taxing that it will bring your system to it's knees. The only other complaint I have is that the Firewall has now been bundled with their anti-virus software to form their "Internet Security" package meaning that updates to the firewall only are likely to end soon. All that being said, you can certainly do worse than this one. This product has been renamed to Comodo Internet Security. It's still freeware. Now includes Firewall, Antivirus, HIPS (Defense+), Buffer overflow protection. Comodo Firewall has really turned to horse #*$% in this latest release (3.0). The UI has become a cumbersome nightmare (for example, unable to sort program rulesets by program. You can only sort by path, and even that doesnt work right. There's just too many things to list. The UI is a total mess compared to the previous version which I actually liked). This firewall is pretty overhyped. It gets high ratings in tests, but I wonder how much real-world protection people really get from this. It gives a false sense of security - this firewall brings up a warning for just about every frivolous event that occurs on your computer. This in itself can become pretty tedious and annoying in a very short time. I'll explain more on why this seemingly heightened security is bad in a sec. The WORST part about this firewall - is that some programs inexplicably get free unrestricted access to the internet without so much as a confirmation. Oh sure, a big program like Mozilla Thunderbird brings up the usual "connect to the internet" confirmations, but various programs I DL'd off of Bit Torrent, the cultivator of computer plagues, gets free access without so much as a blip on the radar. After having 1 million confirmation windows shoved in my face every minute by this firewall, I find this internet favoritism to be quite a irritating. The firewall may be ok for preventing attacks, however, I cannot recommend this for someone wanting to protect from identity theft (keyloggers, etc.) or other unauthorized broadcasting by trojans which may have slipped past your Anti-virus. That it would just allow some programs (quite a few seem to get this privelage with comodo) free, unrestricted access to the internet, without any confirmation whatsoever, is just completely asinine for a program which tries to "protect" you from malware by force feeding you a million confirmation pop-ups a minute over the most frivolous things. Ive been using Comodo for a few years now, and I've had high respect for them up until release 3.0. Now it's just gone to crap. It can get the job done, but it needs constant, and I mean CONSTANT tinkering and TLC in order to get what you want out of it due to its poor design. Otherwise it's simply a false sense of security. I just put this app in today and it is easy to configure and remembers what you allow without repeatedly asking for approval. Comodo Firewall Pro is recommended in the latest issue of PC WORLD magazine and I can see why they like it too. Amazing and true protection :) Learn just how to use it and everything is great! Read up on the program and you'll know what to use and when to use it. i tried the 3.0 beta program which caused my computer a total crash and had to reinstall the os. that was 6 months ago, i thought the final version would be better, how wrong was I!!! seems more like a gigantic virus than a firewall. maybe it is incompatible with nod32 i have, i don't know, but i am so frustrated with it, and for sure i would not test this application any time soon. RedBoar what are you on about on XP it's using about 1.5 mb's and even on scan it's still light,and with the all the multitude of functions and security levels(that may have been your problem with it,set anything to high and you may strangle it)it has to be the best firewall and it's free. I cannot recommend this, with every revision it slows down my PC more and more. Version 2 was far superior and reminded me of when ZoneAlarm was good, now version 3 seems like a victim of bloat and carelessness in programming.